Once a year, the Rouillac auction house settled in a Loire Valley castle which becomes the framework of one of the most prestigious meeting of the art market in France. 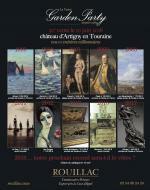 The 30tH edition takes place in the castle of Artigny (Touraine), from the 8th to the 11th June 2019. The exhibition and the sale continue in the castle’s lounges and through the garden thanks to the Grandes Etapes Française which bring this five stars hotel alive throughout the year. In Vendôme and Paris, by appointment at the experts. Friday, June 8th, from 3 to 7 pm. Saturday, June 9th, from 10 am to 5 pm. Sunday, June 10th, from 9 to 11 am. Monday, June 11th, from 9 to 12 am. From Paris, take highway number A10 and exit at N24 (Chambray-Montbazon) or take exit N10. Parking for cars and autocars. TGV from Paris-Montparnasse (1h trip), arriving at the Saint-Pierre-des-Corps station (12 km) or Tours Centre (16 km). It is possible to lease a taxi cab. Built by the famous French perfumer Coty, the Château d'Artigny dominates de valley of Indre. This elegant restaurant-hotel is located at 15 km away from Tours, in the heart of a park of 25 hectares.